I’ve been spending time in Austin this spring for family reasons. On a recent Saturday, I visited the remarkable Downtown Farmers’ Market. I got there late, past noon, and almost all of the vendors had mostly sold out and begun packing up. One stand still had a look resembling bounty, despite the late hour and the blistering heat: Johnson’s Backyard Garden. At Johnson’s stand, I picked up some beautiful kale, a couple of onions, and some small dark-blue potatoes labeled “first of the season.” I know from working on a farm that the first potatoes you pick are spectacular little flavor bombs full of sweet earthiness. From another stand, I scored local bacon from pastured hogs and a dozen eggs. As I scurried away sweating under the Texas sun, I was already plotting what to do with it all: a “breakfast hash,” inspired by one of my favorite Austin restaurants, 24 Diner. Based on the principle that when we eat meat we should do so as mindfully as we can and waste as little as possible—and also because pork fat delivers magnificent flavor to everything it touches—I used the fat rendered from cooking the bacon to saute the other ingredients. Preaheat oven to 350. Lay bacon slices on a heavy-bottomed skillet and cook in oven until well-browned and crisp, 20-25 minutes. Remove pan from oven. (Leave the oven on.) Lay the cooked bacon over paper towels on a plate, setting it aside, and carefully drain the hot fat into a glass jar, leaving just enough fat on the pan’s bottom to cover it. Put the skillet, which will still be hot, over medium heat on the stovetop, and add the potatoes and a dash of salt. Stir them around a bit and once they begin to sizzle, cover the skillet and put the pan in the oven. Let the potatoes cook a while; the cover will allow them to steam in their own liquid. Meanwhile, put another skillet over medium heat, and add enough oil to cover the bottom. When the oil is hot, add the onion and let it saute, stirring occasionally, until translucent, 10 minutes or so. Add the garlic and, if you’re using it (as you should), the chipotle, and let them sizzle for a minute as you stir them in. Now add the kale, a pinch of salt and a splash of water. When it begins to sizzle, turn heat to low, cover, and let the greens cook, stirring occasionally. When they’ve reached the almost-tender stage, remove the lid, turn the heat up a bit, and cook the greens until they’re fully tender and most of the water has evaporated. Meanwhile, check the potatoes. When they are almost done—easily pierced by a fork—remove the lid and let them roast a while. With the lid off, their liquid will evaporate and they will begin to brown. Remove from the oven when they crisp up. At a certain point, your potatoes will be crisp and brown and your greens will be tender, both ready to be combined with the bacon and eggs. Here’s how it will work. Put the skillet containing the cooked potatoes, which will still be hot and thus need to be handled carefully, on the stove top over medium-low heat. Chop the bacon into chunks and add it to the pan, stirring to combine. Add the cooked greens, stirring them in to incorporate. 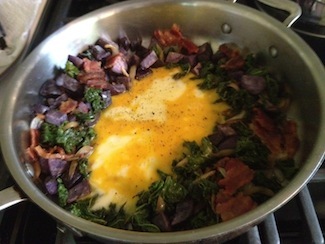 Make a hollow in the center of the pan by pushing all the ingredients to the edges (see photo above). Add a small spoonful of the pork fat to the cleared center, and give it a minute to get up to heat. Now pour the eggs in, and give them a minute to set at the bottom. Then gently toss the eggs with everything else, and you have a hash.